Who do you think made Dale Earnhardt most proud in Bud Pole Qualifying Wednesday night for Sunday's NASCAR Winston Cup Series Coca-Cola 600 at Lowe's Motor Speedway? OK, it was probably his son, Dale Earnhardt Jr., who will start in the 8th position in his first career race in the series. In fact, it was almost definitely "Little E" who put the biggest smile on "Big E's" face. The seven-time NASCAR Winston Cup Series champion has plenty of good news from his 'other' team too, though. In their first full week together, Steve Park and new crew chief Paul Andrews hit on quite a successful combination. Park will start 5th in Sunday night's marathon after posting only the second top-5 Bud Pole Qualifying effort of his series career. Making Park's effort still more impressive is the fact that it's his first Coca-Cola 600, an event notoriously difficult to get a good setup for. Teams have no night practice time before time trials, which get under way at 7 p.m. ET and run into the evening. This time last year, the young driver from New York state was recuperating from injuries he suffered in a practice crash at Atlanta Motor Speedway. Park was quick to give credit to his team, which has been in this position before -- with Darrell Waltrip in last year's 600. The three-time series champion started 43rd in this event last year before charging to a respectable 17th-place finish. 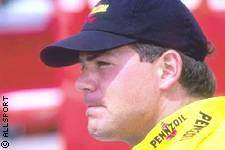 Park particularly credits Andrews, who guided Mayfield to a win in last year's Winston Open and a pair of strong starts in the two official races at LMS in '98. "The guys in the engine shop are building awesome engines," Park said, "and the guys in the chassis shop are building great cars, so it's finally all coming together. It's not all about Steve Park; it's about these guys that have been working real hard to get these cars put together. "It's helped out a lot (to have Andrews). It's built my confidence. He told me right before I went out, 'Man, don't worry. This car's gonna stick.' To be able to go out there and just trust in his judgment that it's gonna stick, makes a world of difference to me." It could have been even better. Park was fastest in the shortened and delayed afternoon practice session, turning a lap around the 1.5-mile oval in 29.233 seconds, at an average speed of 184.722 mph. He was .15-second faster than Bud Pole winner Bobby Labonte in practice. However, while Labonte picked up nearly 1/4-second from practice to Bud Pole Qualifying, Park actually lost a bit. He clocked in at 29.247 seconds, at a speed of 184.634 mph -- far from slow, but disappointing compared to others at the top. It was evidence that despite the progress, Park still has some distance to go when it comes to confidence. "I think when I get rid of some of these nervous jitters when I go out knowing I've got a car that's capable of sitting on the pole is when we're gonna get our first pole," Park said. "Hopefully before the year's out." Park's next task is bigger, more difficult and more important. He's got to race well and finish well. That's been a problem for a driver who has yet to finish in the top-10 in 33 career NASCAR Winston Cup Series starts. He placed 12th at Darlington in March for a season-best finish, but the following week at Texas he was unable to sustain the momentum. The No. 1 Chevrolet started 3rd in the PRIMESTAR 500 at Ft. Worth, but limped to a disappointing 32nd-place finish, 45 laps off the pace. Two weeks ago at Richmond, he started in the top-20 and was running in the top-5 before he got mixed up with Derrike Cope and finished 34th. Last weekend at Lowe's, Park topped the first practice session, but mechanical problems relegated him to 11th place in his qualifying race for the Winston Open and he was unable to make up that much ground in the race. Now he's got another chance -- in fact, he's got 600 miles worth of another chance. "I don't have much experience here in a Cup car," Park said. "Especially in the 600, I've never had an opportunity to run it. We need to get a good top-10 starting spot, and we need to stay out of trouble for the first 500 miles and get through all the pit stops and try to get to the end. "It's gonna be tough. I've never run 600 miles before. I've just been conditioning myself and eating right, and I think that's what it's gonna take to get to the end of the 600 miles." It'll also help to have some confidence and a good race car.